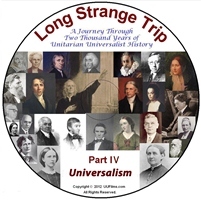 This film documents the development of Universalism from the early German and English pietists such as Jakob Böhme and Jane Leade, and 18th century English ministers such as George Whitfield, James Relly, Georges de Benneville, and John Murray. It chronicles the emigration of de Benneville and Murray to America and their roles in the formation of an organized Universalist religion. It tells the story of the Thomas Potter incident and the role Judith Sargent Murray played in the movement. It tracks the theological development of the movement through Murray, Elhanan Winchester, and Hosea Ballou. It discusses the unprecedented explosion of Universalist churches across America during the first half of the 19th century, and why the movement began its precipitous decline after the death of Hosea Ballou. 1:04 minutes long and includes English sub-titles. To read the discussion guide from the UUA's Faith Development Office click here.